Afternoon booze hounds! I'm back again with some more fabulous finds from Britain's superstores. Last week it was Sainsbury's and this week I'm presenting some of Waitrose wonders. Yeah that's right, Waitrose! Three more delights from Britain's favourite middle class supermarket await you further down the page. First up, Waitrose lager! Now, unlike other supermarkets, Waitrose don't really do a cheap French lager that costs a pittance a case. What they do do (hehe) however are a Czech, a German and a Belgian lager. 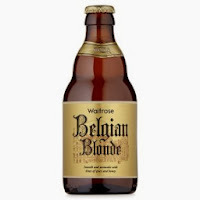 For this little experiment I've chosen the Belgian (as it's the cheapest and let's face it, Belgian beer is brilliant!). It has a lively blonde colour and a nose of intense citrus fruit. The palate is rich with hints of Candied orange peel and honey. It's got a nice body to it with impressive length and a satisfying finish. Of all the regional lagers, it's the best priced at £1.78 a bottle. Next up is the cider offering. 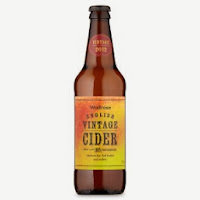 Last week it was a Somerset cider, so I thought I'd do a bit of a variation and go for the Vintage Herefordshire Cider. A really pale straw colour, the nose is bursting with the smell of sweet Bramley apples with a hint of spice. The palate is smooth and succulent with a slight bitterness on the finish and just the tiniest of burns on the back of the throat, giving it an off dry character making for a really good thirst quencher. Proper Lush at £2.09 a bottle. Lastly, we have Duchy by Waitrose IPA. 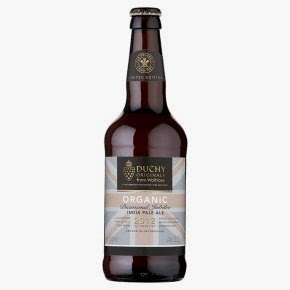 Duchy, as many of you may know, is the organic food company started up by Prince Charles. This beer certainly has a regal bearing about it. It's a rich golden brown colour with a sweet, chocolatey nose. In the mouth, it's smooth texture is interspersed by the delights of caramel, chestnuts and a delightful hoppy zing. This is a rich and complex beer and actually one of the best IPA's I've had the pleasure of tasting in a long time, none of that namby-pamby, flouncy, pyjama knitting stuff that you get from some breweries. And to top it all off, it's only £2.09 a bottle. So there's your money saving beers to get you through to next week when I'll be sampling the delights of Tesco!